This PNAS piece definitely takes the pick for the most suggestive abstract I have seen in recent history. The picture above is of a butterfly pea flower. Look at it closely. 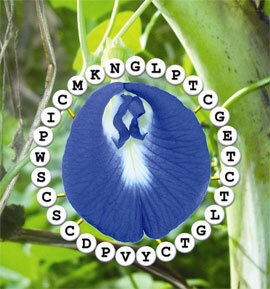 Its scientific name is Clitoria ternatea. The paper talks about the biosynthesis of a protein isolated from the plant. One of its functions is to "speed up childbirth". Things happen when nature's creations collide with human vocabulary. And no, there's wasn't an actual creator that engineered the relationship between the shape of the flower and the function of the protein. That's just us humans at our pattern-seeking best. There are also pink species of the genus.